Everyone likes to incorporate their own little touches in their own wedding. It's what makes their wedding their wedding. For some people, it means just having pictures of the bride and groom as children. Other people might have cake toppers that better reflect the couple. For a very specific minority, it means having llamas at the wedding. That's what happened according to the bride's sister. My sister Nicole is obsessed with llamas. She has llama designed bags, pencils, and pretty much any llama made things you could think of. 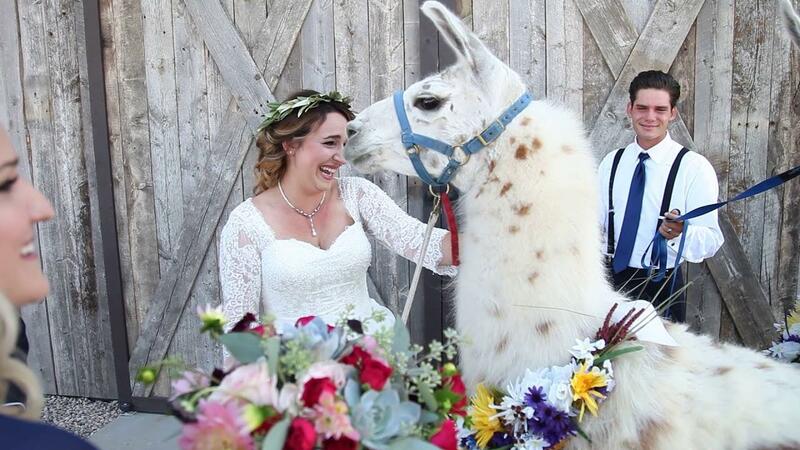 For months she has been requesting llamas at her wedding and been denied the request. This is her response when the Maid of Honor, our sister Mandii, and Mandii's husband Spencer surprised her and Keith (the groom) with llamas before the wedding. Like all weddings, people have a lot to say about this one, and especially about one detail in particular. Comment from discussion This is what happens when your maid of honor gets you the perfect wedding present. Just remember if you are looking for the perfect wedding gift, you can't go wrong with llamas.